His research interests are in the areas of unconventional geomechanics, fluid flow in fractured porous media, coal seams in particular, and the coupled computational modelling associated with unconventional gas extraction, CO2 sequestrations and underground mining operations. He is the recipient of American Rock Mechanics Research Award for 2011, a member of SPE and AusIMM, and has been serving as an associate editor of International Journal of Oil, Gas and Coal Technology since 2015. 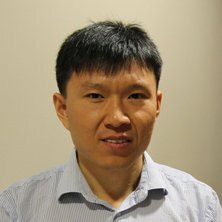 * computational geomechanics * coal mine strata control * roadway stability analysis and its optimum supporting design * unconventional gas recovery and carbon sequestration, including coal seam, shale and other tight gas reservoirs. Supercomputer simulation and evaluation of deep mining induced gas burst and its control. Wei, M. Y. , Chen, Z. W. , Liu, J. S. , Cui, G. L. , Tan, Y. L. and Zhang, S. W. (2017). Multiphysics of coal-gas interactions. In Analysis, modeling and design (pp. 481-512) Amsterdam, The Netherlands: CRC Press. Qu, H, Liu, J.S, Zhongwei Chen, Connell, Pan and Connell, L. (2011). A fully coupled gas flow, coal deformation and thermal transport model for the injection of carbon dioxide into coal seams. In Manchao He, Luis Ribeiro e Sousa, Derek Elsworth and Eurípedes Vargas (Ed. ), CO2 storage in carboniferous formations and abandoned coal mines (pp. 69-93) Leiden, The Netherlands: CRC Press/Balkema. Hui, Yanchao, Chen, Zhongwei, Zhang, Jixiong and Ju, Feng (2013) Coal Mine Workface Geological Hazard Mapping and Its Optimum Support Design: A Case Study. Disaster Advances, 6 5 (Special Issue): 66-84. Huang, Yanli, Zhang, Jixiong, Li, Meng, Jiang, Haiqiang and Chen, Zhongwei (2013) Waste Substitution Extraction of Coal Strip Mining Pillars. Research Journal of Chemistry and Environment, 17 Special 1: 96-103. Effect of the effective stress coefficient and sorption-induced strain on the evolution of coal Permeability: Model development and analysis. Li, Qiang, Chen, Zhong-Wei and Mao, Xian-Biao (2009) Application research of support relief technique in open-off cut. Wuhan Ligong Daxue Xuebao/Journal of Wuhan University of Technology, 31 10: . Zhou, Lai, Feng, Qi-Yan, Chen, Zhong-Wei, Li, Xiang-Dong and Liu, Bo (2009) Effects of coal swelling on modeling of CO2 sorption on the coal and correction approaches. Meitan Xuebao/Journal of the China Coal Society, 34 5: 673-677. Zhang, Jixiong, Miao, Xiexing, Mao, Xianbiao and Chen, Zhongwei (2007) Research on waste substitution extraction of strip extraction coal-pillar mining. Yanshilixue Yu Gongcheng Xuebao/Chinese Journal of Rock Mechanics and Engineering, 26 SUPPL. 1: 2687-2693. Bai, Tianhang, Chen, Zhongwei, Aminossadati, Saiied M., Danesh, Nima, Pan, Zhejun, Liu, Jishan and Li, Ling (2016). Impact of flow regimes on coal fines generation during coal seam gas production process. In: 50th US Rock Mechanics / Geomechanics Symposium 2016 Proceedings. 50th US Rock Mechanics / Geomechanics Symposium, Houston, TX, United States, (356-365). 26-29 June 2016. Tian, Chengyu, Pan, Zhejun, Chen, Zhongwei, Connell, Luke D. and Zhang, Xi (2016). Modelling of supercritical gas hydraulic fracturing: Using the PKN model as an example. In: Challenge the limits with knowledge. International Conference on Geomechanics, Geo-energy and Geo-resources, Monash University, Melbourne, Australia, (749-755). 28-29 September 2016. Azadi, Mohsen, Aminossadati, Saiied Mostafa and Chen, Zhongwei (2016). Numerical simulation of integrated reservoir-borehole flow for pre-mining drainage. In: Naj Aziz, Bob Kininmonth, Jan Nemcik, Ali Mirza, Ismet Canbulat and John Hoelle, Proceedings of The 2016 Coal Operators' Conference. 2016 Coal Operators' Conference, Wollongong, Australia, (249-262). 10-12 Feb 2016. Chen, Zhongwei, Bai, Tianhang and Aminossadati, Saiied M. (2015). Characterization of coal fines generation: importance of flow condition. In: 7th International Conference on Mining Science and Technology, Xuzhou, China, (). April 26-29, 2015. Bai, Tianhang, Chen, Zhongwei, Aminossadati, Saiied M., Pan, Zhejun and Liu, Jishan (2015). Prediction of mobility and settlement position of coal fines during dewatering. In: CSG 2015 Proceedings. China Shale Gas 2015, Wuhan, China, (). 6-8 September 2015. Peng, Yan, Liu, Jishan, Pan, Zhejun, Connell, Luke and Chen, Zhongwei (2014). A fully coupled model for caprock sealing efficiency. In: J. F. Labuz, 48th US Rock Mechanics/Geomechanics Symposium. 48th US Rock Mechanics/Geomechanics Symposium, Minneapolis, Minn, United States, (). 1-4 June 2014. Chen, Zhongwei, Liu, J., Wang, D. E. S and Wu, Y. (2013). Evolution of coal permeability under unconstrained swelling: contribution of matrix-fracture interaction. In: Laura J Pyrak-Nolte, Alvin Chan, William Dershowitz, Joseph Morris and Jamal Rostami, 47th US Rock Mechanics / Geomechanics Symposium 2013. Proceedings. ARMA 2013: 47th US Rock Mechanics / Geomechanics Symposium 2013, San Francisco, CA, USA, (1945-1955). 23-26 June, 2013. Wang, Jian-guo , Liu, Jianxin , Liu, Jishan and Chen, Zhongwei (2010). Impact of rock microstructures on the supercritical CO2 enhanced gas recovery. In: International Oil and Gas Conference and Exhibition in China, Beijing, China, (). 8-10 June 2010. Liu, Jishan, Chen, Zhongwei and Qu, Hongyan (2010). Multiphysics of coal-gas interactions: the scientific foundation for CBM extraction. In: 2010 SPE Asia Pacific Oil and Gas Conference and Exhibition. 2010 SPE Asia Pacific Oil and Gas Conference and Exhibition, Brisbane, QLD, Australia, (). 18 - 20 October 2010. Chen, Zhongwei , Liu, Jishan , Pan, Zhejun , Connell, Luke and Elsworth, Derek (2010). Relations between coal permeability and directional strains and their application to San Juan Basin. In: 44th U.S. Rock Mechanics Symposium and 5th U.S.-Canada Rock Mechanics Symposium, Salt Lake City, UT, United States, (). 27-30 June 2010. Wu, Yu, Liu, Jishan, Chen, Zhongwei, Elsworth, Derek, Connell, Luke and Pan, Zhejun (2009). Dual poroelastic response of coal seam to CO2 injection. In: 43rd U.S. Rock Mechanics Symposium and 4th U.S.-Canada Rock Mechanics Symposium. 43rd U.S. Rock Mechanics Symposium and 4th U.S.-Canada Rock Mechanics Symposium, , , (). June 28, 2009-July 1, 2009. Wu, Yu , Liu, Jishan , Chen, Zhongwei , Connell, Luke and Pan, Zhejun (2009). Dual poroelastic response of coal seam to CO2 injection. In: 43rd U.S. Rock Mechanics Symposium & 4th U.S. - Canada Rock Mechanics Symposium, Asheville, NC, United States, (). 28 June-1 July 2009. Chen, Zhongwei, Liu, Jishan, Elsworth, Derek, Connell, Luke and Pan, Zhejun (2009). Investigation of CO2 injection induced coal-gas interactions. In: 43rd U.S. Rock Mechanics Symposium and 4th U.S.-Canada Rock Mechanics Symposium. 43rd U.S. Rock Mechanics Symposium and 4th U.S.-Canada Rock Mechanics Symposium, Asheville, NC, United States, (). 28 June - 1 July 2009. Chen, Zhongwei, Liu, Jishan, Connell, Luke, Pan, Zhejun and Lai, Zhou (2008). Impact of effective stress and CH4-CO2 counter-diffusion on CO2 enhanced coalbed methane recovery. In: 2008 SPE Asia Pacific Oil and Gas Conference and Exhibition, Perth, WA, Australia, (). 20-22 October 2008.